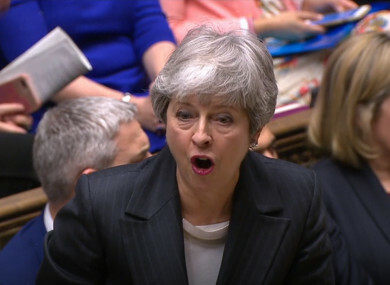 THE UK PRIME Minister has confirmed that she has sought to delay Brexit, and said the House of Commons had “indulged itself on Europe for too long” as she seeks to finally secure the UK’s withdrawal from the EU. During a feisty Prime Minister’s Questions this afternoon, Theresa May said she’d written to European Council president Donald Tusk formally asking to delay Brexit until 30 June. However, an internal briefing memo from the European Commission said this departure date would bring “serious legal and political risks”, ahead of a meeting with EU leaders. The Commission’s memo has urged instead that EU leaders to choose between a short delay to 23 May or a longer one to “at least until the end of 2019″. That 30 June date would mean the UK would not need to hold elections to elect representatives to the European Parliament, May indicated, but this is at odds with the EU’s position. The EU says that, like Ireland and all the other EU countries, if the UK is in the EU after 23 May, it’ll have to elect new MEPs. A European Commission spokesperson said this afternoon that Jean-Claude Juncker “formally warned” May against including a date for extension that is after the EU elections – which take place across EU countries from 23-26 May. “As Prime Minister, I am not prepared to delay Brexit any further than 30 June,” May told the House of Commons today. The idea that three years after voting to leave the EU, we’d be asked to elect new MEPs would fail to deliver on the referendum result. In her letter to Tusk, May said that it wouldn’t be in the interests of the UK or the EU to hold European Parliament elections. She told Tusk she had intended to have a third meaningful vote on her withdrawal agreement – which has already been rejected twice – but said the intervention of house Speaker John Bercow has “made it impossible in practice to call a further vote” ahead of a meeting of EU leaders tomorrow. The UK had been due to leave the EU in less than 10 days’ time on 29 March, but May closes her letter seeking an extension of the Article 50 withdrawal mechanism until 30 June. Speaking in the House of Commons today, Labour leader Jeremy Corbyn accused Theresa May of having “no plan” and of plunging the UK into a “full-scale national crisis”. May said she was seeking an extension and fully intended on another meaningful vote on her Brexit deal. “The outcome of a long extension [beyond 30 June] would be this house spending yet more endless hours failing to address issues that matter to our constituents,” she said. This house has indulged itself on Europe for too long. It’s time for this house to determine that it will deliver on Brexit for the British people. They deserve better than this house has given him. Corbyn shot back that for her deal to stand a chance of getting through, May would have to come back with substantive changes. Email “May formally asks Brexit be pushed back to 30 June - but EU warns of 'serious risks' and 'legal uncertainty'”. Feedback on “May formally asks Brexit be pushed back to 30 June - but EU warns of 'serious risks' and 'legal uncertainty'”.